Would You Like to Leave Your Comfort Zone? The term Comfort Zone is a very popular word in self-help books and life coaching. “You need to leave the comfort zone”, we often hear in different areas of society: private life, relationship, self-development, sport, work, politics, etc. But, did you ever wonder, what does it mean to be in the comfort zone? What is that zone? And what does comfort you in that zone? Recently the whole structure of my family, I’m surrounded by on the daily basis, massively changed. A few days ago the core of my family was made by my husband and me, and our three cats, and tons of golden dust day geckos. On the New Year’s Eve of 2018, we made a surprising discovery. 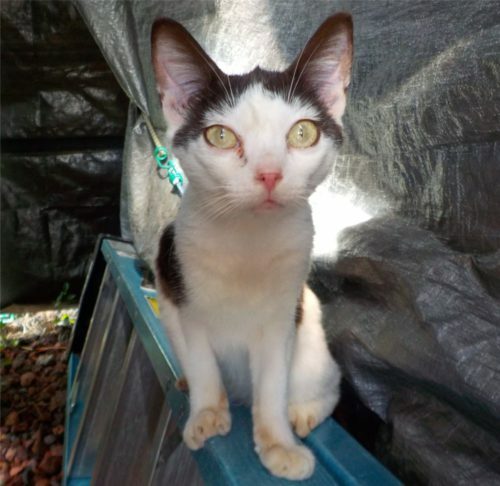 On my husband’s motorcycle, Honda ST that is put to winter sleep and therefore covered by a tarp, we found a little cat that was in terrible shape: thin like a piece of paper, with dirty fur and bare skin shining through his thin coat. His or her age was hard to estimate. Only the clear eyes have let us think that it could be a young cat. Cats which are hanging out at the East Coast of Hawaii are often bitten by fire ants which love to bite them in the eyes. Therefore, most of older cats here have cloudy eyes. This little thing looked so sad as if he had experienced lots of struggles and pain in his short life. Our three cats are in fact our neighbor’s cats. They moved over to us one after another. 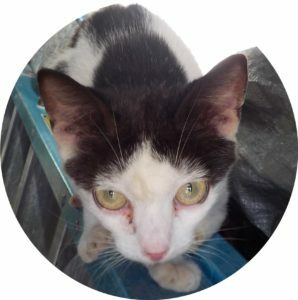 We helped them with different health issues, de-wormed them, gave them roof over the head. All of them are outdoor cats what means that they are their own lords. They can go wherever they want to but they love to hang out with us. Of course, this have a negative impact on our relationship with our next-door neighbors. Therefore, we tried to find a way how the cats would go back. We know only a few pieces of the story why the cats migrated to us. And, after eight months of back and forth, we arranged with the situation and the cats stayed with us. The three cats had some issues with each other, so we invested time to help them to tolerate each other. When I saw the little one for the very first time, I thought, he may stay with us for a night or two and then vanish silently as he came. Because the one night I saw one another cat there, I wondered if his mother brought him to us to get help. He rejected the food we offered him. And because he looked so terrible skinny and sick, I thought that he might have come to us to die. The next day was a New Year’s Day, and the little guy was still sitting on the Honda, watching everything that happened around him. We couldn’t touch him, he was hissing, and we couldn’t offer help in any way. So we waited on what would happen next. Finally, he made an approach on his own, and before we could think about any strategies to introduce him softly into the group, he was fearless walking around trying to make contact on his own. The touch we gave him and the dry place to be, helped him to completely transform in no time! We named him Honda after the motorcycle we have found him on. Unfortunately, all three cats rejected him hissing at him and Buddy, our oldest really gorgeous looking cat even hit him. Monki, a beautiful Siamese ran away and stayed away. Mocca, another awesome looking Siamese stayed around but avoided any closer contact with the newcomer. Buddy also quit eating his food. This morning I asked my husband if he would give Honda away to get our three cats back. He smartly returned my question: “Would you?” “No!” I said. “Honda will stay. We helped those guys to heal, gave them a roof and good food. They are spoiled. If they want another home, they can leave. They are beautiful, and it is easy for them to find somebody who likes them. They can go to their prior owners too. This little guy really needs help. I’m actually in some way embarrassed, seeing these spoiled beauties and this ugly looking poor thing. Somebody needs to take responsibility.” Don’t get me wrong. I love those cats. However, in this act of unconditional love, I needed to let them go. We started to envision the changes Honda confronted us with. We detected several benefits, improvements, and chances. All was good! You may wonder what the story has to do with a comfort zone and how it answers the questions addressed above? A comfort zone is a system you created to deal with the outer world. It describes how you feel and think, what you do, how you do it and when, how you interact with others, also animals, and who is around you in your daily life. It implements all your decisions and choices you make every day. A comfort zone may be very comfortable for you or let you suffer a lot. It doesn’t really make a difference. It is what you built, know, accept and are used to. It is a pool of different habits of thinking, feeling and acting, you once installed for a good reason. Mostly the pressure to leaving a comfort zone points a certain period of life, where we know we need to change to move on in the direction we want to go. This morning I understood that the comfort zone is much more than that. Stop Walking in Your Old, Worn Shoes! It is like walking in old, worn shoes which don’t serve you well anymore. Like the little Honda who, though little and sick, but fearless tried to become friends with the big boys and got rejected, I leave the new and fresh in my life. I’m welcoming the unknown structure that still needs to emerge every single moment and then pass by. I learned from one of my big teachers, Bill Harris, that, it is the resistance that let us suffer. When you let the resistance go, all suffering also vanish, and you can face a new beautiful world surprising you with his gifts. Honda is a new beginning for us and a symbol of change. Would you like to start fresh? What is the beginning for you? Thank your very much for taking time and reading my post. I hope you enjoyed it and gained many benefits from it. I would love to read your comment about your experiences with your comfort zone. So, please take few minutes and give me a feedback! If you have any questions, please, write them down! I would love to answer and to support you on your way! ← Smile Yourself Healthy and Worry Free! As I live on a farm there is a lot of space. I always had cats, sometimes masses of cats and also dogs. Normally there would be no problem with only 2 big exceptions. I had saved a cat from the middle of town and took her to my apartment. When I moved a year later to my farm Missu came along of course together with a mother and her babies. Years later a female dog and her child appeared and did not want to leave. After 3 days I started feeding them. They behaved nicely but Missu went away. 2 months later I heard she had moved up to the nursery like 500 meters away. The workmen loved her to bits and would always bring her nice leftovers. She took care of the rats there. I went up, she recognized me. I told her we were going home now and started walking across the fields. She followed me but only halfway. Then she sat down. She could see my house from there but refused to come back home. When a cat makes up her/his mind you cannot change it. I was sad but knew she was treated well. Once I had 2 completely white cats and they did not have a nice character. Lilly was a small and nervous cat and the white ones pestered her away. Years later when my Mother moved into her new house next door Lilly suddenly appeared and adopted my Mother. Cats can bring you sorrow and also happiness. I hope your little Honda will soon be ok and that the other cats will accept him. As I am a Taurus I am quite set in my ways. Something really big has to happen before I will leave my comfort zone. It has happened in my life but not too often. I was so glad, reading your lines. I actually don’t have a lot of experience with cats. I have had dogs around me for over 35 years; mainly German Shepherd, dogs you can work with and having their support if needed. With cats I basically have two experiences: One, when I was a child I brought a young homeless cat home. He stayed with us for a while, and we called him Buras. Unfortunately, after he got sick with a skin disease my mother banished him. I was looking after him and bringing him food without letting my mother know. I heavily suffered under that situation. Later on, an elderly women in a neighbor’s house took him to her. I never forget this beautiful deed! She also helped me a lot. In my twenties, I was able to bring Joint, my German Shepherd with a maybe four-weeks-old kitten that I named Amigo. It took me four days to do this. Joint took care for this little baby like a cat mother, carrying Amigo around, licking him. Of course, over a period of eight months, I collected some experiences with our incessant visitors: Buddy, Jamocca and Coco Monki – how we called them. We supported them giving them a roof over the head when they needed it and helped them with their injuries and skin problems. Mocca and Monki returned to their owners. But, they are occasionally visiting us. Since few days Buddy came to eat three times a day as he was used to in the past. But he cannot stand the two new cats around. This was already a problem in the old constellation, even though they come from the same owner. Buddy is the one who drove my attention to the kitten on the motorcycle. First off, I saw only Honda’s huge eyes full of fear. I saw he is extremely miserable and offered him food. He didn’t eat. However, I knew, if he wants to stay, our door remains open. I anticipated changes and felt uncomfortable about it. But, I also knew if one of the cats needs my help, so it is the sick and skinny little guy! I got following results of leaving my comfort zone: I’m at peace with the neighbors. For a long time I felt guilty having the cats by us. Buddy can still have his home with us. He won’t return to his owners. To take care for the cats is a blessing, and to watching them playing a joy! Honda gives me a kiss, I guess, every day. I have read your comment after you posted and it helped me a lot to understand and to accept! I delayed my answer conserving my time for the newcomers and staying away from the computer. Please, let me know if I can support you in any ways! I would love to though I know you don’t expect anything in return! Thank you so much for your time for reading and commenting. I appreciate it a lot! Love and light to you, Taeske! What a wonderful world to have a peep into. Very much the same as us humans, but slightly different. In the animal world comfort zone means security, contentment, freedom and closeness. For us humans comfort zone means relaxed feelings, doing what you know best and fakse contentment, but at the same time it adds stagnation without any growth and sometimes seen as laziness. Where I stay no domestic animals are allowed, and it is a huge amiss. I long for the loving touch of a cat or dog everyday. there is something missing in ones soul. I had many cats and a few dogs. The last one was a pekingnese doggy by the name of Chico. What an wonderful experience, he was a true companion. We had an ecceptional bond andThank you for bringing back all the fond memories. after many years I still mourn his passing at nine years of age. Thank you for bringing back fond memories. My pleasure, Stella!! Yes, it was overwhelming first to profound change the setted up structures. But the results are benefiting for all sides: the cats, our neighbors and us. It is such a pleasure to watching the kittens playing. With Honda, we welcomed a healer cat in our home, a very special animal I never met and experienced before in that way. Short: We took risks, and a new beautiful world opened its gates for us! The cats are teaching us a lot! Thank you for sharing with me your touching experience with Chico! I can feel into it. About 22 years ago I lost Joint, a beautiful German Shepherd girl with awesome character. We were (and still are) bound together. She was a part of me. She died of cancer being nine years old. She is in my heart. I wish you to find a new home once where you can enjoy the presence of animals! It is priceless! Thank you for taking time for reading and commenting on my post! Please let me know if I can serve you in any way! Or answer your questions! I’m there for you! Send you love and light for your way!